For those who have followed along with the inner workings of the Odyssey Adventure Club, you know that Bob Smithouser has recently taken over the role of OAC Producer from Brock Eastman. 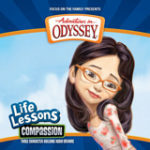 This weeks Official Adventures in Odyssey Podcast delves into the history of both Bob and Brock. Executive producer Dave Arnold joins Jesse to interview Bob and Brock. The pair tell their stories about how they started working at Focus on the Family, the creation of the Odyssey Adventure Club, and the new direction in the Club: Brock is moving to a new position outside Focus and Bob is taking over the role of Odyssey Adventure Club producer. You can hear the latest edition of the podcast here.